It was too big a stretch for squash. This week, even before Rio starts, the International Olympic Committee (IOC) considers which sports will be at the next Olympic Games in Tokyo in 2020. Skateboarding, for one, is “optimistic” about its inclusion. Golf went through this process four years ago and for its athletes, the Rio Olympics should be a sight for sore eyes. After a 112-year absence, the sport will return to the Olympic stage. Yet what should be a momentous occasion has turned into a spectacle of a different kind with top players dropping out amid flimsy excuses and awkward questions over why the multi-billion dollar sport is there in the first place. Many sports have tried and failed to get into the Olympics, a feat that is expensive, convoluted, and a political minefield. Yet it is a long and difficult process that many enter willingly and repeatedly—despite multiple setbacks. Only five sports—athletics, cycling, fencing, gymnastics, and swimming—have been staged at every Olympic Games since the first in 1896, although the “disciplines” and “events” (think athletics > sprinting > 200m) within the sports themselves have been tweaked. To be considered for the Olympics, a sport must first be recognized by the International Olympic Committee (IOC). To do that, it has to have an international federation overseeing it and adhere to the World Anti-Doping Code. Only then can a sport’s federation apply for IOC recognition. Until 1992, demonstration sports were a stepping stone toward full status, often allowing a host city to showcase a national sport—like glima (Icelandic wrestling) in Stockholm in 1912 or baseball at Los Angeles 1984. But that largely ended after the Barcelona Games of 1992, when it became apparent that the host cities and authorities had more than enough on their plate organizing official events—an exception was made for Beijing to showcase wushu in 2008. The Olympic program is reviewed after each Games by the Olympic Programme Commission, made up of IOC members and representatives of the National Olympic Committees, international federations, and athletes. This body evaluates each sport’s “value” to the Olympic brand and mission. It then does the same for any IOC recognized sports that are campaigning for inclusion. The Committee makes its recommendations to the IOC, whose members vote on whether to action them during its general meetings. It’s here that Olympic dreams are ignited, extinguished, or indeed rekindled. In 2013, the Commission recommended dropping wrestling from the 2020 and 2024 Olympic Games—only for the subsequent vote to keep it in. That initial recommendation had pushed wrestling into a dogfight with seven other sports vying for inclusion—baseball/softball, squash, karate, climbing, wakeboarding, wushu, and roller sports. 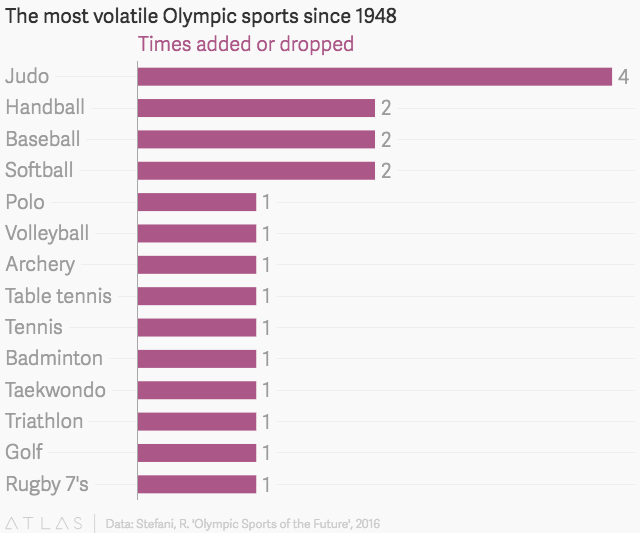 Only baseball and softball had ever been an Olympic sport before. Those two sports teamed up in 2011 to make a stronger joint bid, and although they failed to make the cut for 2016, the Committee has recommended their inclusion for the Tokyo Games in 2020, unsurprising given baseball’s enormous popularity—and existing stadia— in Japan and the lucrative US professional league. It still has to survive the official vote—taking place in August after the Rio Olympics—but the viewership and sponsorship it attracts make a compelling case for the “added value” the IOC seeks, much as golf before it. For a sport to enter, another sport has to fail to make the cut. Spare a thought, then, for squash—three times the bridesmaid but never the bride. Its athletes have campaigned for 15 years, saying that Olympic participation would represent “the pinnacle of the sport.” Squash made several changes, mainly to make the sport’s professional tournaments more telegenic and thus more lucrative, but which had the knock-on effect of also being attractive to the IOC. These spectator-friendly changes include using all-glass courts and even moving the entrance to the courts away from the back wall, where it’s traditionally located, on to a side-wall. Squash’s campaigning put it in a great position for 2016 consideration, but having impressed the IOC enough to get shortlisted, its failure to make the cut meant nothing when the next chance came around. For the 2020 Games, squash found itself behind other sports that the Tokyo Olympic Committee had themselves put forward—some, like karate, which had been dropped from previous programmes. In the end, squash didn’t even make the shortlist for Tokyo. “It’s difficult for the players and the squash community to understand that,” Shelly says. The squash community remains desperate to be a part of the Olympics. Some argue that the point of the Olympics is to champion the amateur sportsman and give the spotlight to those that aren’t already rolling in professional money. The flames of this debate outlast even the Olympic torch.